As much as I love displaying my family pictures around the T house, it's nice to mix things up with art work here and there. I'd love to be one of "those people" who can walk into a gallery and drop a few mil on a Van Gogh, but instead I am one of those people who can walk into a Target and drop fifteen on a mass-produced plaque with a witty saying printed across the front. So I was quite delighted to hear that a blogging friend, Sarah, opened her own Etsy shop in May of 2010, after much encouragement from her readers. She features her unique (and affordable!) 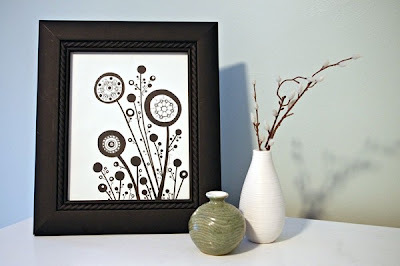 artwork: Abstract drawings concentrating on detail and line, with lots of flowers, leaves and swirls--with a feminine and whimsical touch. Today, I am pleased to introduce my friends to Sometimes I Swirl. Sarah has been drawing since elementary school, crafting intricate and abstract swirling patterns on notebooks, shoes, bags, her wall, and even (yes!) on the back of her hand. Her work is inspired by Mehndi/henna, painter Paul Klee, surrealism, and pretty much anything painted or drawn in black on a white background. 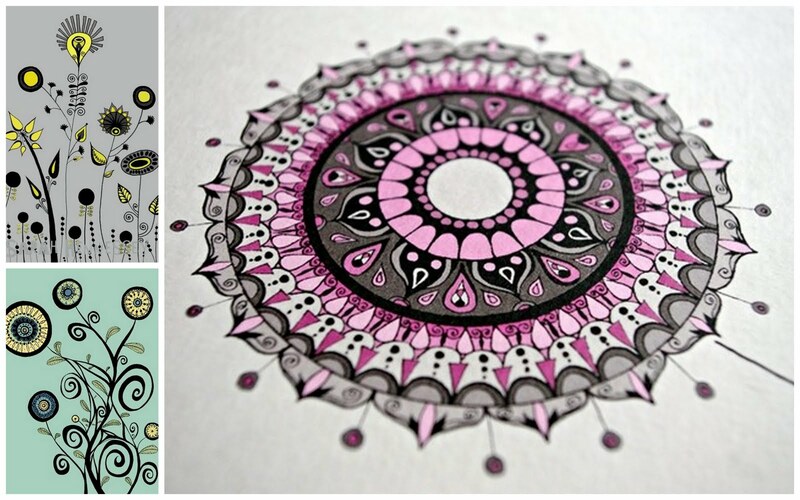 Not having any Indian ancestry, Sarah notes that it's her love of symmetry that draws her to this type of art. I'm drawn to the little details. With such detailed designs, I feel like Sarah makes good use of color. Too much would saturate the work and overpower her design. The Gray, Canary Yellow, and Black abstract (below, left) is my favorite piece. When browsing the shop, I really liked the fact that Sarah offers framed pieces and shows us how her art might look in your home. Readers who enjoy modern art, colorful design, and a little bit of retro might just fall in love with Sometimes I Swirl. Something else I love? Whimsy. Owls are all the rage right now, and these owls are a hoot. For real. 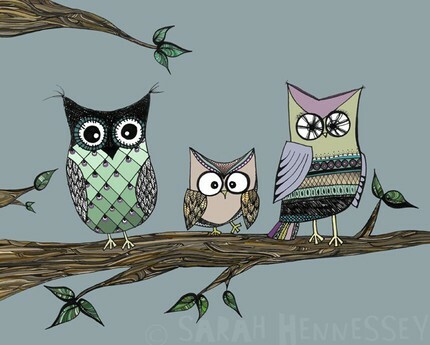 How cute would those owls be in a nursery? If that print doesn't work with your color scheme, guess what? 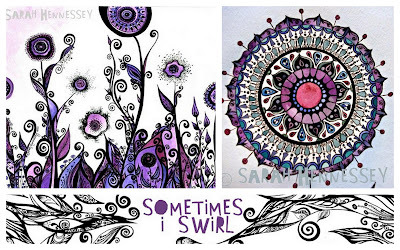 Sometimes I Swirl is happy to take on custom orders at no extra charge! I always check shipping policies when I peruse an Etsy shop's pages, and I was surprised (and happy) to read that Sometimes I Swirl guarantees next day shipping, with the exception of custom drawings that may take a few days to create. With a 100% positive shop rating, I'd say it's a win-win with Sometimes I Swirl. You can also find Sarah blogging over at Hennessey House, where she writes about her family's experiences with their first home. 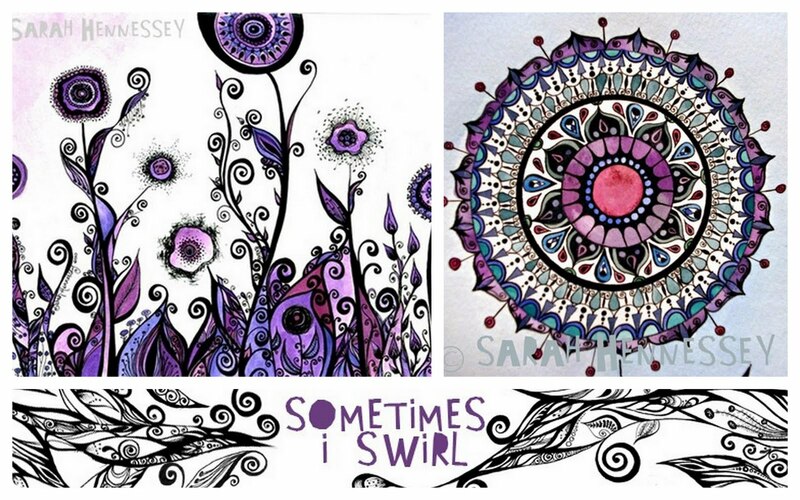 Today, Sarah is offering a reader a $20 Gift Certificate (in the form of store credit) to Sometimes I Swirl! 4. Link up to my Dishing It! party with a valid link. Hope you'll consider stopping by the Dishing It! party. We're sharing about summer experiences this month and having fun meeting new bloggers. If you've already linked up, please be sure to visit around! 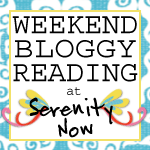 Come back tomorrow for some Weekend Bloggy Reading (with a twist). Sarah's work is really unique. I like so many, it is hard to pick. The owls would look so cute in my classroom and the abstract ink flowering landscape would be pretty framed in my home. Amanda, I really love the "Climbing Flower Pods in Greens & Blues" 8x10 print. I think the greens are what especially draw me to this piece. I like Sarah's work. It has a great vibe to it. Wouldn't she make a great fabric designer?? Oh wow! Those are so unusual and gorgeous!!! Thank you for introducing us to her work!!! You are such a great bloggy friend!!! Can't wait to go check out her blog!!! I like Peacock shows off her swirls. And thanks for introducing us to this artist. I am such a believer in Etsy but it is so huge, it is not always easy to find the gems like this. I just love owls so I would have to say "Well, Hello Owl" Black and White 8x10 Print would be one of my faves...but there is just so many to choose from! I linked up to Dishing it! I wish all the entries good luck: this is a wonderful giveaway! Wow...what lovely designs! Hard to choose, but I love the "Swirl Take-over" one! I love the Surreal Garden print!! umm...yesterday it was well, hello owl. today it is circles upon circles. My favorite is Peacock shows off her swirls. How pretty right? Thanks so much for the chance. I love Sarah...followed her blog for a while now and have thought about buying of her pieces too. Thanks for the chance to win one! I like them all but the Large Spirals and Leaning Flowers Print would be great in my kids' bath. SometimesISwirl is already one of my favorites on Etsy. Hard to choose just one, but I think "Black and Grey Flower Garden" is my favorite. Love her work! 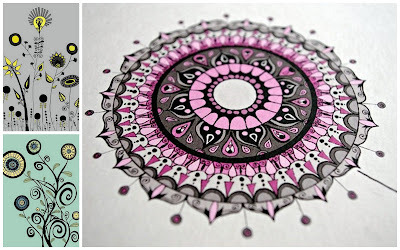 I have discovered Sarah this month at etsy and I am inspired by her art work. I like the most Abstract Ink Flowering Landscape. And I'm part of the Dishing It party!!!! I love all the owl prints. They are my favorite, hands down. She is such a talented artist. Thanks for the chance to win. Wow! She's amazing and affordable! Beautiful work. I love the Large Sprials and Leaning Flowers! Being an architect, I'd have to say I'm drawn to the crooked city one! These are great! I like the Surreal Garden with Black Ink Flowers! Oh my gosh, it's so hard to choose! 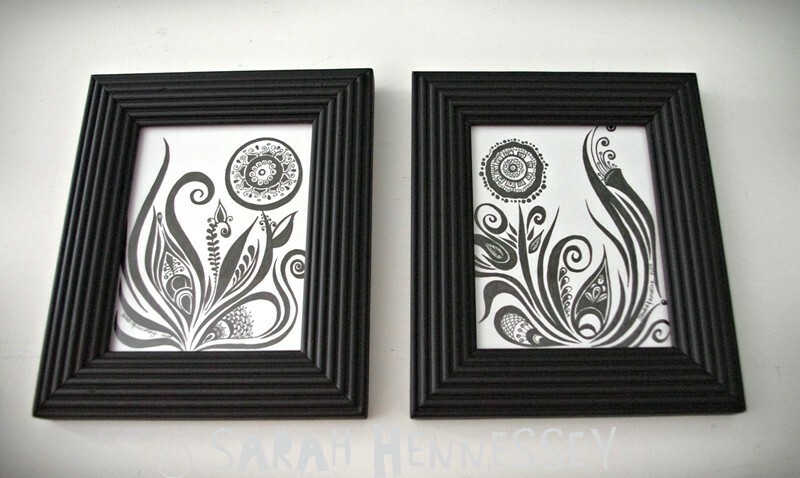 If I had to choose right now, though, I think I'd go with "Custom Framed Original Drawings - Two Abstract Flowers". Just gorgeous! Thanks for the chance to win! I would love a print of the Blue Navy Teal Ink Drawn Flower Garden! The abstract ink flowering landscape in blues and greens is my favorite, but they're all amazing! I love Sarah's owl picture. My Granny loves owl's and every time I see one I think of her. MY husband and I moved across the country a few months ago and I miss my Granny dearly. Sarah's owl picture would definitely cheer me up when looking at it!! thanks for this giveaway! 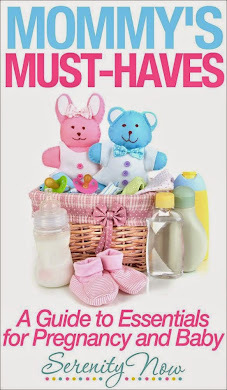 i have been following sarah's blog for a while, which is where i saw this giveaway. 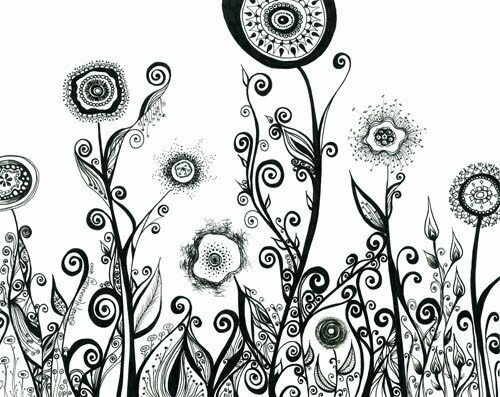 i would love a piece done like her header, with little houses, but in her shop i like the mandala flower and the flowers in pots. fingers crossed!! Oh I'm torn, I really like the Purple and Teal Flower with Mustard Background, but I adore those Owls! I love the style and the colors she uses. I can see using these in either my master bedroom of the main bathroom. Brilliant. I LOVE LOVE LOVE Sarah's blog and etsy shop! I have been wanting to buy the Surreal Garden for a while now, but with planning my wedding all non wedding spending has been put off for a little while... BUT as soon as Oct 16th comes around, I will definately be purchasing one of her pieces! Her work is awesome!!!! So talented!! This is my favorite one! I'm having a giving at my place too! Drop by and enter if you want too! It's so hard to narrow down which one I like best, but I think Surreal Garden is my fave, followed closely by Morning Light! Wow! This is beautiful art and so unique. I like all of the designs but I really like the Large Spirals and Leaning Flowers. So pretty! The teal and purple flower would fit perfectly with my office. Beautiful!